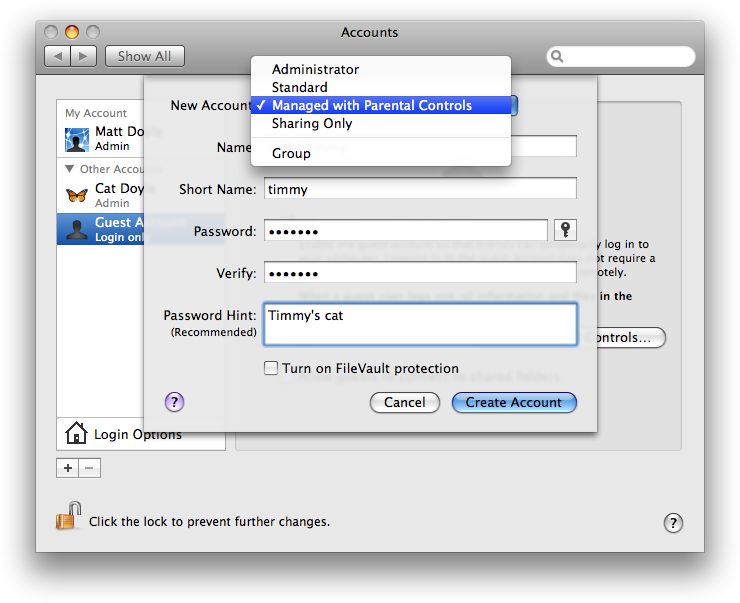 One thing that makes Mac OS nice to use is that it doesn’t have a million pointless preferences to tweak. The same is true for the apps that come with the Mac. Fun though preferences are to mess around with, too many settings tend to clutter up the interface and get in the way of real work. However, many users like a bit more control than the Mac gives you out of the box, which is why Apple and other app developers often include “hidden” preferences in their apps. Such preferences aren’t settable in an app’s Preferences dialog, but you can adjust them by editing .plist (property list) files or by using the defaults shell command. That’s all very well, but many users aren’t comfortable editing complicated settings files or running shell commands. 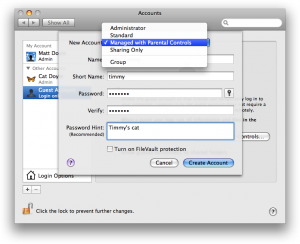 What’s more, how do you find these extra preferences, if they’re not in the Preferences dialog? 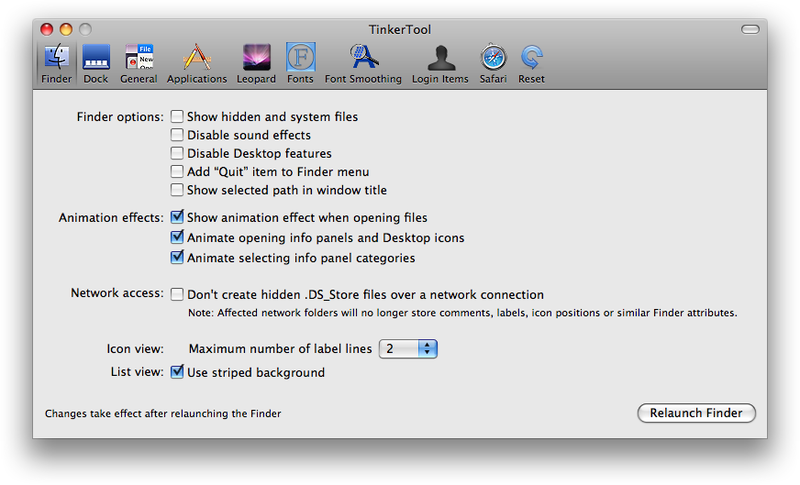 Enter preference-tweaking tools like TinkerTool. 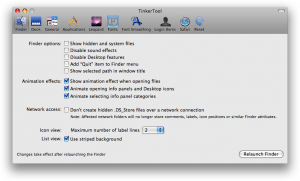 This free app gives you a nice graphical interface to many of those squirrelled-away Mac OS and app settings. A major complaint from many iPhone users (myself included) is the lack of text selection and cut/copy/paste between apps. It still strikes me as amazing that Apple left these pretty fundamental features out of an otherwise advanced phone. What’s more, Apple has thwarted pretty much any attempt by third parties to add copy and paste functionality between apps. Pastebud is a clever new Web application that attempts to address this issue. Rather than being an iPhone app as such, it gives you limited “copy and paste” functionality on your iPhone by sending the text to copy to the Pastebud web server, at which point you can paste it back into an app on your iPhone. Installing Pastebud is straightforward, but you need to do it from the Mac or PC that syncs with your iPhone and you have to use Safari or IE7. The process involves dragging a COPY bookmarklet and a PASTE bookmarklet to your bookmarks bar, and adding your unique Pastebud email address to your address book. Then you sync the iPhone to add the bookmarklets to the Mobile Safari bookmarks bar, and the Pastebud contact with your iPhone contacts. Having used both Windows and Mac OS X over the years, there’s little doubt in my mind that my Mac is, overall, nicer to use than any Windows PC. And of course, this is a Mac blog, so many of my posts invariably end up singing the praises of Macs and all things Apple. Change the desktop theme – including wallpaper, taskbar, window styles and fonts – to anything you like. Try doing that on a Mac. With Windows you’re not tied into one manufacturer with a limited product range like you are with Mac OS (Psystar notwithstanding). On a budget? Any cheap clone will run Windows. Want something that exactly matches your lifestyle or situation? The range of PC options is huge so you’re bound to find something that suits. 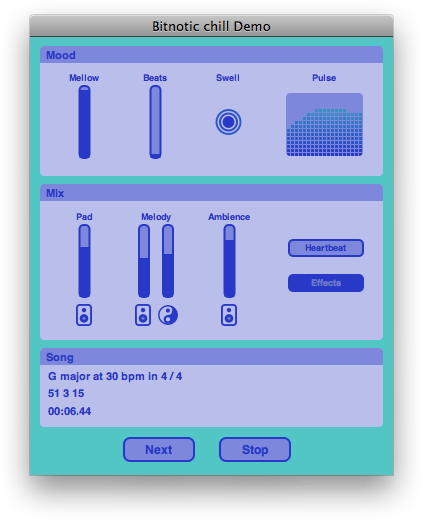 Bitnotic’s recently-released chill ($19.99) is a Mac application that automatically generates soothing, chilled-out music that’s perfect for relaxing, meditating or working to. This kind of “generative music” has been around for a long time, with software such as SSEYO Koan (now superseded by Noatikl) providing a lot of control over the music created, allowing you to tweak over 100 parameters that affect the “composition”. Mellow controls the overall “chilled-ness” of the music. High values result in major scales and chords, happier sounds, and cheerier ambient noises (sea, bells, and so on). Low values kick the track into minor keys, accompanied by distinctly un-chilled ambient sounds (such as sirens and something that sounds like a machine gun!). Beats sets the music’s beats per minute. Because this is ambient music, the maximum BPM is 80, with the minimum being a very leisurely 30. Click Swell to create a crescendo at the start of the next bar, with chords, melo dies and ambient sounds played together. Pulse shows the activity level – the higher the graph, the more things are happening in the music. It varies automatically over the course of the track, but you can click it to influence the activity level (in some mysterious way). Pad determines the volume level of the pad sound that plays the main chords. The left Melody slider controls the volume of the two melody instruments, while the right slider adjusts the mix of the two instruments (both their relative volumes and how often they’re played). Ambience adjusts the volume of the ambient noises in the track. Click Heartbeat to add a heartbeat sound to the start of each bar. Click Effects to control whether the music includes fades, echoes and reverb. You can turn this off to create a dry mix for processing later (with Cubase or Logic, for example). chill gives you lots of options for listening to your creations. You can save the last track to iTunes, AIFF, MIDI format and so on, and create continuous music with the chill Radio option. You can also control the app using your Apple Remote, and send real-time MIDI events to other music apps, allowing you to augment the music with your own sounds and beats. The music produced by chill isn’t half bad; it sounds generally coherent, with enough variation to keep things interesting. Some of the melody and ambience sounds can be a bit cheesy in certain contexts, and some of the transitions can be somewhat jarring and “computer-like”. However, with a bit of tweaking you can get some quite professional-sounding results. Even better, the music produced by chill is royalty-free, making it an affordable way to acquire ambient music for playing in public spaces or massage/relaxation clinics. You can download a free trial that doesn’t have the export options and stops playing after 7 minutes – enough to give you a decent taste of the app. FluidTunes is an interesting new free app from Majic Jungle Software. The idea is that you can move between tracks in your iTunes library by waving your hands at the screen. 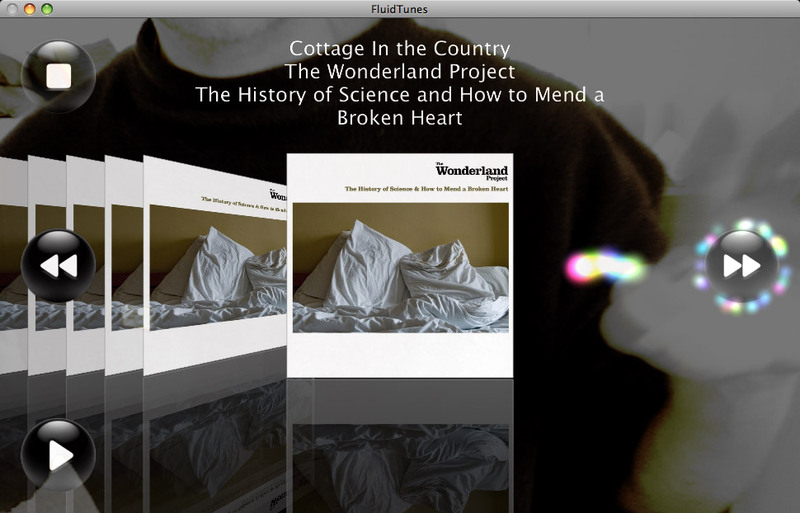 Your waving is picked up by the Mac’s built-in camera, and FluidTunes analyses the image to work out what you want to do. Unfortunately the reality doesn’t quite live up to the promise. I was envisaging some sort of background app that detected right-to-left swipes across the screen to quickly advance to the next track, and left-to-right swipes to go to the previous track (and possibly top-to-bottom to pause, and so on). This would have been both cool and futuristic, and genuinely useful to boot. In practice, you have to switch to the app in order to use it (which hardly makes it quick to use), and you then have to look at an image of your hand in the app window, guide your hand to a button, then shake it about a bit to activate the button. By which time you might as well have switched to iTunes and clicked the track skip buttons (or, for that matter, hit a key combo using the excellent SizzlingKeys). You can also swipe through the list of tracks Cover Flow-style, though it shows each track as a separate image rather than grouping by album, which makes the list massive, and it’s quite hard to locate an individual track. What’s more, if you move from the “next track” button to the “play” button to play the track, you sometimes end up inadvertently swiping through about 50 tracks as you go. So not much practical use, but a cool tech demo, and a taste of gesture-based interfaces to come. Using the camera to read your gestures is a great idea, especially as practically all Macs now have some sort of built-in camera. It’ll be interesting to see how this idea develops over time. Could this be a viable alternative to multi-touch displays? Anyway, the app’s free, so download it and see what you think! Parallels 4.0: Triumph or train wreck? Parallels recently released version 4 of Parallels Desktop, their Mac virtualization app that lets you run other operating systems such as Windows and Linux alongside Mac OS X. The new version promises even better integration with the Mac, and up to 50% faster operation. I’m a relatively happy Parallels 3 user, but I’m not upgrading to 4 – at least, not yet. The Parallels support forums are inundated with upgrade problems, reports of v4 being slow as molasses, horror stories involving Windows BSODs and Windows activation issues, complaints about poor technical support, and lots of irate users demanding their money back. Enough to put me off for now, thank you very much. This Register article paints a pretty gloomy picture of the whole torrid affair. Of course, you’re going to get problems and complaints on a support forum, but nevertheless it does sound like version 4 has some serious issues. I had a hunch this would happen sooner or later. Parallels strikes me as a company that has grown at a faster rate than it can handle. They caught the Intel Mac wave at just the right time, trouncing the market leader, VMware, with a solid, fast app that let a whole bunch of new Intel Mac users run Windows on their Macs. Along with Boot Camp, Parallels was probably a big contributor to the success of Apple’s move to Intel. Now, Parallels may have become a victim of its own success. With over a million Parallels Desktop users (and all the sales and support issues that entails), and growing competition from the likes of VMware and VirtualBox, the company seems to be groaning under the strain. In their rush to catch up with VMware’s Fusion 2.0 release, it sounds like Parallels’ developers may have rushed Desktop 4.0 out the door without proper Q&A or beta testing. This is all a shame because, at its heart, Parallels Desktop is a very nice product. I’ve used Parallels versions 2 and 3 for years now, and, for those times when I do have to hold my nose and boot Windows(! ), it’s perfect. What’s more, it sounds like Parallels Desktop 4 is potentially a big improvement over both version 3 and VMware Fusion 2.1 – if only it worked properly. I hope Parallels manages to sort out the version 4 issues soon, before their reputation gets too badly tarnished and more disgruntled customers jump ship to VMware Fusion or VirtualBox. Personally I’m holding out for 4.1 before I consider upgrading. You are currently browsing the Reality Distortion: Macs, Mac OS X, and Apple stuff weblog archives for December, 2008.